Here’s a funny story—Yesterday I was at work and the mail man came to the door with two boxes in his hand and a really strange look on his face–kind of a scared, curious, embarrassed look. I, of course, took one look at the boxes and knew immediately that my second pair of new running shoes had arrived at last (they were back-ordered from Nordstrom)! I took them from him and he fumbled around for the other letter and magazine that he was bringing. I could tell he wanted to ask me something, but he was embarrassed. Finally he asked sheepishly if I minded telling him what was in the boxes. I laughed and told him that my running shoes were in the boxes. He asked if they were regular shoes still looking hesitant. I told him that they were my personal running shoes from Nordstrom. He had this great relieved look on his face and told me that when he saw the boxes were for Prosthetics South he was terrified that he was going to be driving along delivering his mail and one of the boxes were going to open and a body part was going to fall out! 🙂 He seriously thought that a hand was going to be in the box or something! He said he thought he would have wrecked his mail truck if that would have happened. I assured him that he did not need to worry about that. 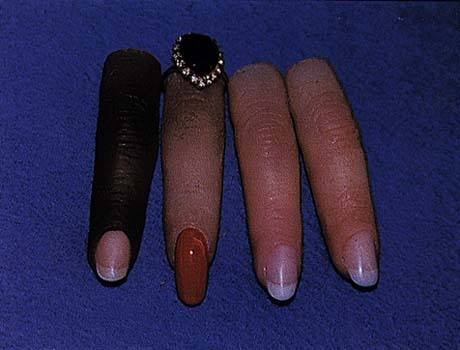 After he left, I really wished I would have whipped out the cosmetic prosthetic finger that a patient never came to pick up. I think he may have requested a route change!!!! ~ by legmaker on March 11, 2008. Hhhmmm, Maybe you should make him a “leg lamp” too :).